I first heard the original recording of Roscoe Mitchell’s piece “People in Sorrow” on the LP of the same name by the Art Ensemble of Chicago when I was a teenager in high school. This was an unprecedentedly miserable time of my life, but it was also an exciting time, as I was hearing a lot of creative music, most of it in the “jazz” genre, that was tremendously inspiring to me, something that awakened in me a sense that perhaps there was something akin to a greater purpose in life and which I feel ultimately contributed heavily to my surviving that otherwise grim period. My experience with my favorite recordings at the time was that some were so compelling to me that I found myself listening to them constantly, while others I felt were so profound and affecting that I could only listen to them occasionally, when conditions were right, as they required a type of concentrated listening bordering on reverent attention. People in Sorrow was one of the latter types of recordings. The music itself became like some sort of raft carrying me safely across seas of my own bitterness and confusion or a torch lighting the darkness. The album itself was recorded during the Art Ensemble’s sojourn to Paris, France, in 1969, a time in our planet’s history I can easily recall despite my youth at the time, a time following the great strides and anguished toll of the Civil Rights Movement and the revolutionary spirit of an idealistic youth culture as the country and the world reeled from the impact of huge changes and upheaval in the form of political assassinations, the Vietnam War, the threat of nuclear annihilation, and the ultimate deterioration of the peace-and-love promise of the counterculture into disillusionment, anger, and violence. As a white middle-class Los Angeles teenager in the early 1970s, my encounter with the Art Ensemble’s music, the Association for the Advancement of Creative Musicians (AACM), and their artistic direction was among the manifestations at the time that provided me with some refuge while raising in me questions about my own racial, class, and global sense of identity. While I didn’t know what inspired Roscoe Mitchell to title his piece “People in Sorrow” (and I still don’t), as I listened to its meditative and poignant collective creativity I felt in touch with both my own suffering as well as the world’s and somehow consoled by the beauty and immediacy of the music at the same time. Something that I feel is an expression of this sort of experience with suffering as well as an element unavoidably found in the roots of this seemingly esoteric form of music is the blues. For me, “People in Sorrow” was one of the deeply influential musical performances I experienced at the time that served as a potent example of magnificent validity of free improvisation and of the transformational power of music. Almost forty years later, looking back and realizing the impact of “People in Sorrow” on my own musical and personal journey, for a number of reasons I found myself entertaining the idea of acknowledging it and giving back in the form of organizing a performance of my own personal arrangement of the piece, a re-imagining that might serve as a suitable tribute to the piece, to its composer, to the group that played it, and to the organization that supplied the foundation for the group’s artistic endeavors, while also using the piece as a vehicle in which to present my own interpretation as an offering of sorts. I waffled on the idea for a few years, not wanting to possibly unintentionally indulge an idea that might actually be arrogant, presumptuous, inappropriate, egregiously audacious, or somehow insensitive, weighing the efficacy or folly of the mere notion of possibly trying to recreate a masterpiece while feeling inspired to honor the work, hopefully drawing deserved attention to it and to its creator(s) in the process. The idea became something more like an aspiration of mine, and eventually I decided to go ahead with attempting to realize it. The result is this concert. In presenting my own take on “People in Sorrow,” I have endeavored to create some new areas of musical exploration in it while consciously making reference to many sections heard in the original recorded performance. While I realize that many of these sections were most likely improvised and consequently happened spontaneously during the recording of the piece back in 1969, I have elected to retain some of these sections’ identities out of respect and appreciation for the original recording. The piece itself is essentially one simple but beautiful theme that recurs throughout, interpreted in a variety of ways and settings, while being connected with and surrounded by extensive free improvisation. My version of the piece retains this approach, allowing each of the highly capable musicians I invited to participate to bring their own special voices and distinctive talents to the realization of it in an uninterrupted flow of what could perhaps be described as guided improvisational sections. This wonderful sound brings me back to my true home. according to the container that holds it. In the spring warmth, it is liquid; in the winter cold, it is solid. When its path is open, it flows. When its path is obstructed, it stands still. How vast it is, yet its source is so small it is difficult to find. How wonderful it is in its streams which flow endlessly. In the jade rivulets, the dragon remains hidden. the clear fresh balm of compassion. and the Ten Directions are all purified. Today, as a musician who chooses to follow in the footsteps of the many great artists who inspired me so many years ago and continue to do so, and as a person who aspires and practices to understand and ultimately transform suffering, this occasion holds special significance for me. Performing this piece offers me a unique opportunity to enable and enjoy an overt confluence of the streams of both my musical and spiritual practices. That such an illustrious and distinguished gathering of participants was willing to share the experience with me and to contribute the depth of their own unique and accomplished artistry to this project awes me; that we were able to realize this dream of mine on a concert with Roscoe Mitchell himself frankly rather overwhelms me. I bow deeply and humbly in gratitude and offer this music to all who suffer, to all people in sorrow, that all may embrace and transform their suffering and find peace, healing, and happiness, the true happiness that our suffering helps make possible. Trapped in a cloud of sadness. Ripe! Ripe! Ripe it was! For something, for anything, to heal my savaged soul. A path wet with the salt of bitter tears. Moment! By moment! By moment! Still attached to your beating heart. This performance is dedicated to Roscoe Mitchell with sincere thanks; to Shaku Gyo Joseph Jarman and Famoudou Don Moye; to the memory of Lester Bowie, Malachi Favors Maghostut, and Philip Wilson; and to the AACM and its many members and supporters. Special thanks to Rocco Somazzi, Jeff Gauthier, Wayne Peet, Carole Kim, Nels Cline, JC Earle, Dave Bondi, Christopher Allis, Phil Stein, Karen and Xinwan Cline, and to my teachers. 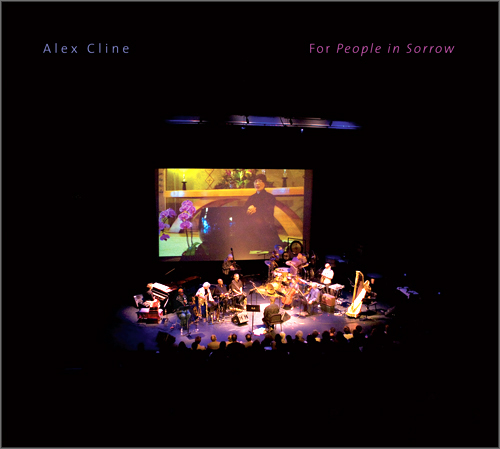 Alex Cline uses Paiste cymbals and gongs, Attack drumheads, and Vic Firth implements of invitation. Recorded live at the Angel City Jazz Festival, October 2, 2011.